The Ware, a simple IP44 rated outdoor corner wall light constructed from rust proof polycarbonate, with a black finish right angle wall bracket and downward facing white pill shaped shade. Completely rust proof and perfect for installation near the sea or in coastal areas. 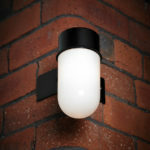 This outdoor wall light simply needs a wipe over with an oily cloth to bring it back to it’s original finish. Designed entirely for external placement on the corner of a building to help light two dark sides at once and capable of accepting an energy efficient LED light bulb to help reduce running costs. From the Enluce premium outdoor lighting range.